Our self-laminating wrap around cable labels are designed to wrap around the cable, laminating themselves as they are applied to create a durable, easy-to read cable label. 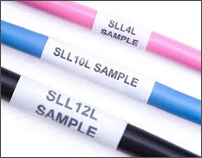 The top third of our cable labels is the print area, and the bottom two thirds is clear polyester which over-laminates the printed part once applied. Labels are supplied on A4 sheets and printed using a standard office laser printer and Sharpmark's FREE Online Labelling Software. Label Material: Matt transparent polyester, laser printable. Adhesive: 3M Permanent acrylic, specially designed for synthetic face materials, with excellent clarity, UV stability, good water resistance, good adhesion & heat resistance.